Just minutes by car from the city centre, The Gateway Hotel Marine Drive offers stunning views of the sea. It features a spa and an outdoor pool bordered by palm trees. The Gateway Hotel Marine Drive is a 45-minute drive from Kochi International Airport and about 3.5 km from Ernakulam South Railway Station. 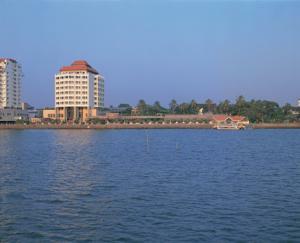 The hotel is just a short drive from Cochin's commercial hub. Each guestroom provides spacious interiors fitted with wooden flooring and warm lighting. They have a flat-screen satellite TV, a minibar and an electronic safe, and come with a modern en suite bathroom. Guests can indulge with a relaxing massage at the spa or enjoy a swim. There are lounge chairs located all around the pool. Blueflame serves grilled seafood and barbequed dishes, while Utsav serves traditional Indian food. Bubble Café provides an all-day casual dining experience and boasts an international menu. Room service is available throughout the day. Rooms: Hotel Rooms: 108, Hotel Chain: Taj Hotels & Resorts. Free! All children under 5 years stay free of charge when using existing beds. There is no capacity for extra beds/cots in the room.